Looking at this chart from a recent paper by Christopher L. Weber and H. Scott Matthews in Environmental Science and Technology, the obvious lessons are that cutting back (through personal choice as well as policy instruments like altered subsidies) on red meat and dairy is important from a climate standpoint. Vegans hoping to leverage climate concerns will lose traction due to chicken, fish, and eggs being in the same ballpark as vegetables and cereals -- though I think non-climate environmental concerns like lagoons of chicken poop and collapsing fisheries could be brought in on those points. More interesting, especially to the 4-to-12-year-old crowd, is the clear climate advantage of sweets over vegetables. So, the first thing I want to know (I'll go and read more carefully, but I think it's a safe assumption...) is whether the analysis assumes current standard practices... and whether those practices themselves are severely problematic (within the confines of the greenhouse gas analysis--I'm aware of their being highly problematic in many other ways). For example, how much of the GHG production is related to the abominable practice of feedlots, raising cattle on corn, and such? For the analysis to be truly useful in crafting a sustainable society on a sustainable world that is only unavoidably warmed up already... we'd need to see the analysis of animal GHG production in a humane manner, fed on an appropriate and natural, organic diet, etc. Counting the commercial, industrial agricultural inputs of corn grown with fertilizer, pesticides and so forth seems like it would skew results, and I suspect the highly unhealthy effects of diets of corn has to have a bad effect on GHG production, too. If a corn-heavy diet does so much harm to a cow's digestive system, the idea that the GHG production of a corn-fed cow is the appropriate baseline is... well... highly questionable, scientifically (but perhaps even more highly convenient for those bearing moralistic banners...). In the meantime, I'll continue to raise chickens for eggs, and smile. You should note that the graph shows the total emissions per household, and thus make rarely consumed items look greener. The correct graph to look at is figure 2 in the paper, not figure 1c given in the link. I mirrored the figure on my old blog, in case you can't read the paper. 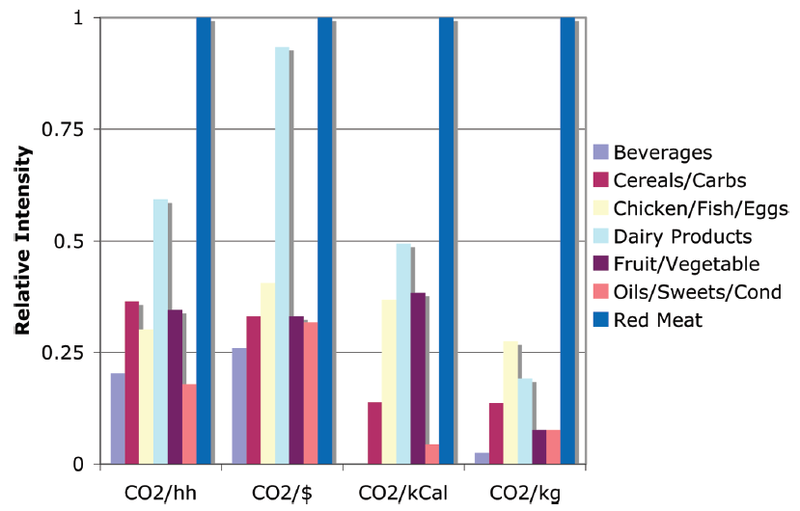 It shows that per unit cost, red meat and dairy have about the same emissions and all other foods emit about one third as much; per calorie, staple foods like cereals and especially oils have by far the lowest emissions. I should add that transportation costs can be lowered by moving freight from road to rail. The reason fruits and vegetables have high transportation emissions is that they're transported predominantly by truck, as demonstrated in the paper. This is because the US freight rail system is built for moving heavy freight like coal and shipping containers at low cost and low speed; thus, it cannot compete with trucks well in transporting perishable items.